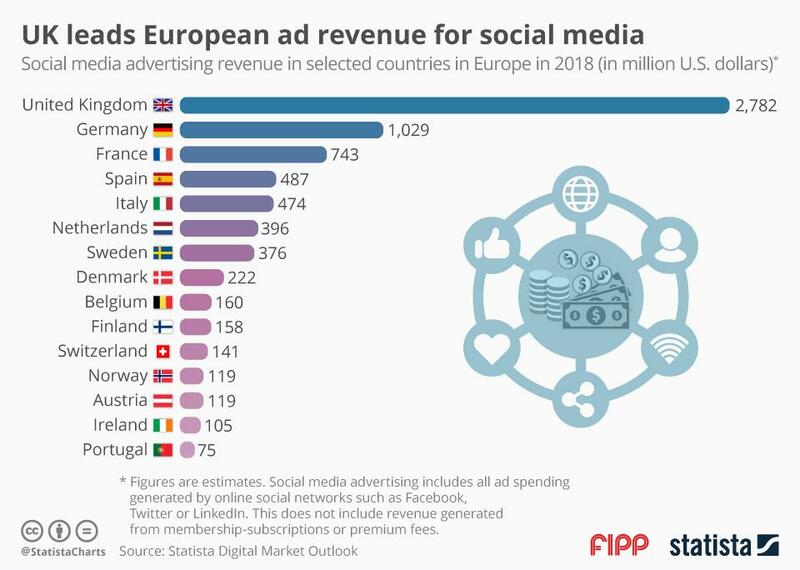 Chart of the week: UK leads European ad revenue for social media The United Kingdom was able to drum up the most social media ad revenue in 2018, according to analysis and forecasts by Statista’s Digital Market Outlook. The UK brought in about US$2.8 billion in revenue solely from advertising on social networks, excluding revenue generated from membership-subscriptions or premium fees. The business model of social media networks largely relies on revenue from ad generation. Among other non-advertisement or marketing related scandals, social media sites, like Facebook, have come under increased scrutiny over who they sell advertisements to, and how they share user data to advertisers. The UK was able to bring in over double the revenue of Germany, the second-place finisher. Germany and France’s social media ad revenue combined does not match the UK’s ad generation abilities. Overall, mobile social media advertising currently surpasses desktop advertising and is forecasted to remain the dominant device for advertisers.